First: as I occupy space on the internet in the week of such unspeakable tragedy, I feel compelled to mention the massacre in Las Vegas and wish peace to those personally affected, and all of us, that we may move beyond thoughts and prayers and towards solution. In the world of sports and marching/athletic music, I know many of us find comfort and enjoyment in crowds of thousands to over a hundred thousand, and this sort of attack must weigh heavy on decisions to be in those spaces. This past weekend, I made the trip out to USF at ECU. One of my excitements about being conferencemates with ECU again had actually not yet been realized, as the only other game in Greenville, two years ago, I was unable to make. Fortune wasn't the kindest to me in scheduling this year either, but after heading west to get east, I made my way along the two lane roads some may associate with landgrant flagships in the middle of nowhere, down to the 252, and into the stadium just before halftime. Priority one was, of course, to get myself into position to see the band. As I got into the stands, the Marching Pirates were surprisingly playing to the side two end zone - the seats they had vacated, and presumably, the student section. They performed the rest of their show to the backfield (as the logo faces) sideline giving me a rearview of the show from my vantage point. I then made my way around to my section - or more accurately, the section I ended up squatting in to catch a friend and be among some of the other NC alumni. While USF led by just a touchdown at the half, the momentum grew in the third quarter. 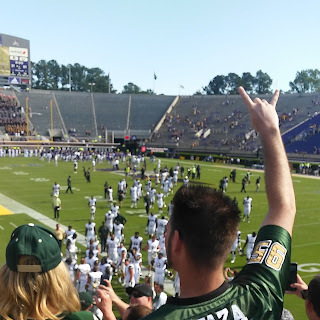 ECU would score their final touchdown about halfway through the third, while USF would continue to impose its will, ultimately dropping a 60-burger (61, actually) on the overmatched Pirates. Having arrived so late, I have an incomplete picture of the ECU gameday atmosphere I've heard so much about. While announced attendance was 35K in a stadium that holds 50, that wasn't my experience upon arrival, and apparently it didn't seem that way earlier in the game either, based on a first quarter text that read, "This place is empty." 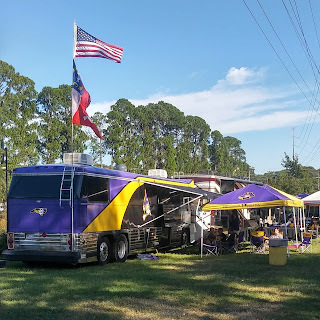 I missed any pregame tailgating, though at least some were back at their rigs after the game (no telling if they waited the game out or got an early start on the postgame). After the game, I followed the sound of drums, as I am wont to do, and caught a pleasant surprise in the form of the ECU Drumline's postgame performance. I was the only green clad fan there, but no one seemed to mind. 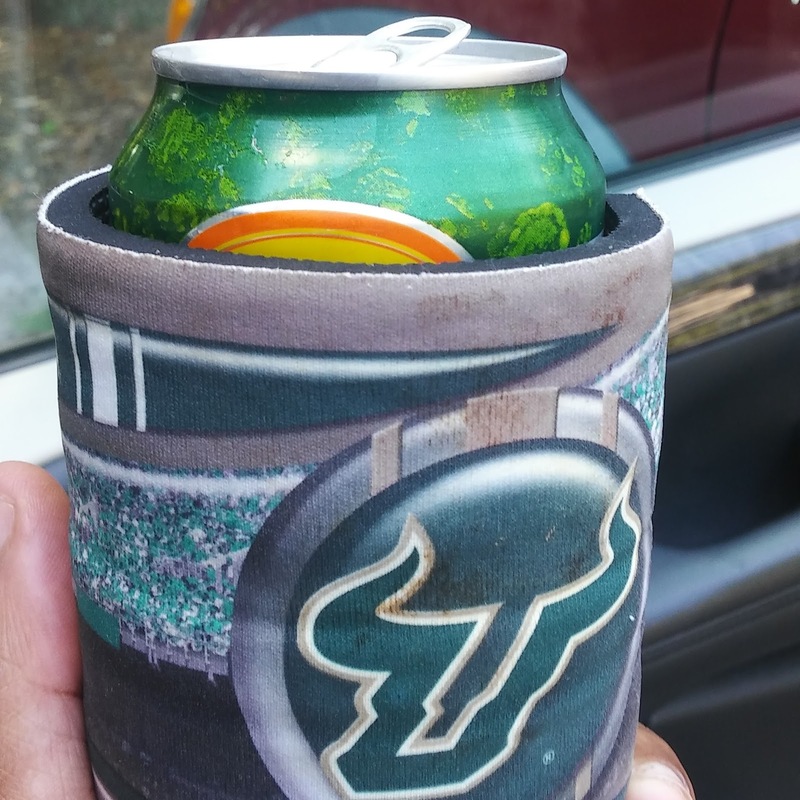 It was a pleasure watching them throw down before ultimately making my way back to the car and treating myself to a postgame beer - Jai Alai from Tampa's own Cigar City Brewing, naturally. From there, it was out to the town. 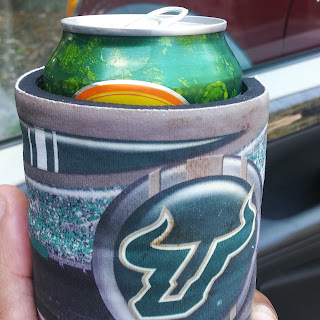 A friend from high school had just moved to Greenville, but we weren't able to catch up; luckily, another friend, a fellow Bull who used to work at ECU, came with several suggestions. Most establishments along the main strip were packed - perhaps a bit more of how Greenville does postgame. I got myself some eastern NC BBQ (when in Rome...) and turned my beer tastes back local as well. Before heading back west, I checked out Uptown Brewery, recommended by a friend-of-a-friend. ECU, I look forward to seeing you again in two years. I know this season's been rough so far, which may have led to the atmosphere, but I hope we can make it a fun one in 2019.